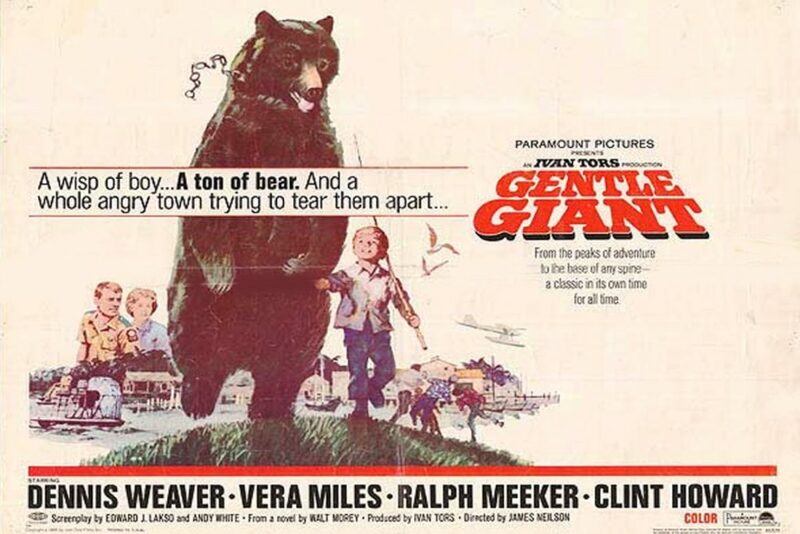 The Stuart Heritage Museum is pleased to present to the community the film “Gentle Giant” an Ivan Tors Production along with Paramount brought to the Hollywood screen based on the 1965 children’s novel titled “Gentle Ben”. The filming was done in Port Salerno, in Palm Beach Gardens, MacArthur Park and in several locations in the Everglades. The story covers the adventures of a Florida game warden in the Everglades, his family and a loveable black bear named ‘Ben’. Well-known actor Dennis Weaver played Tom Wedloe, the game warden; actress Vera Miles was Ellen, his wife and the son Mark was portrayed by 6-year-old Clint Howard (brother of actor Ron Howard). Ralph Helfer of Africa: USA in California provided ‘Bruno the Bear’ who was Ben, along with other bears of different sizes as needed for the movie, all which were flown to Florida. Movie scenes shot in Port Salerno started Monday, September 12, 1966 with many local facilities and people, including Elbert C. Blackman, Jr., owner of the Port Salerno Grocery, Phil’s Boat Yard, Fowler Fish Company docks, James O’Connor’s Drug Store, P. O. Smith’s Grocery Store, and Salerno’s own Coconut Bar located on A1A in Port Salerno. About 17 local authentic fishing boats complete with their boat captains and crews were hired for a total of about $1,000 a day and positioned at the Manatee Pocket. Of special assistance throughout the five days of filming was the Martin County Sheriff’s Department headed by Sheriff Roy Baker and Deputy Slater Grose on hand to direct car and boat traffic, keeping stray boats out of the path of the seaplane as it lands and taxis in for the filming. Approximately 50 local people had an active part in the movie. Ivan Tors Studios in Miami developed the story into a CBS television series named “Gentle Ben” with episodes first aired September 1967 but the Paramount Pictures movie release of “Gentle Giant” was not until November 15, 1967. Many individuals today still remember those September days in 1966 when a movie was made in Port Salerno.